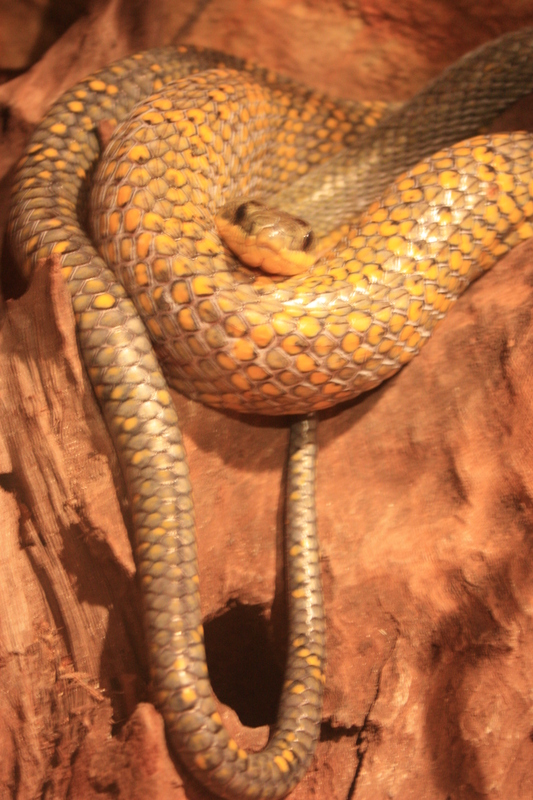 This is an extension of the Serpentarium. This is by far the best butterfly exhibit I have been to. 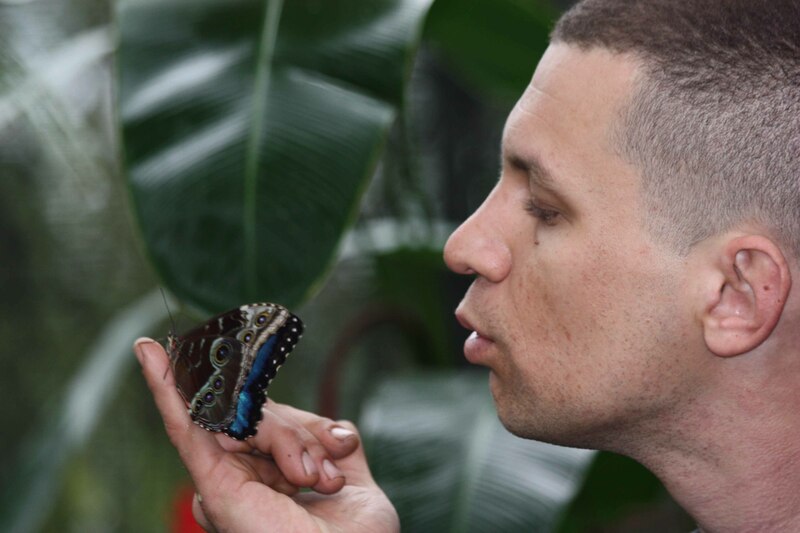 They have four butterfly habitats, metamorphosis laboratory, botanical gardens, insect museum and a frog house. Within the property you can hike down to the river. Be on the lookout for birds including woodpeckers. From here you can get a spectacular view of Lake Arenal. Featuring many snakes, frogs, crocodiles and insects. 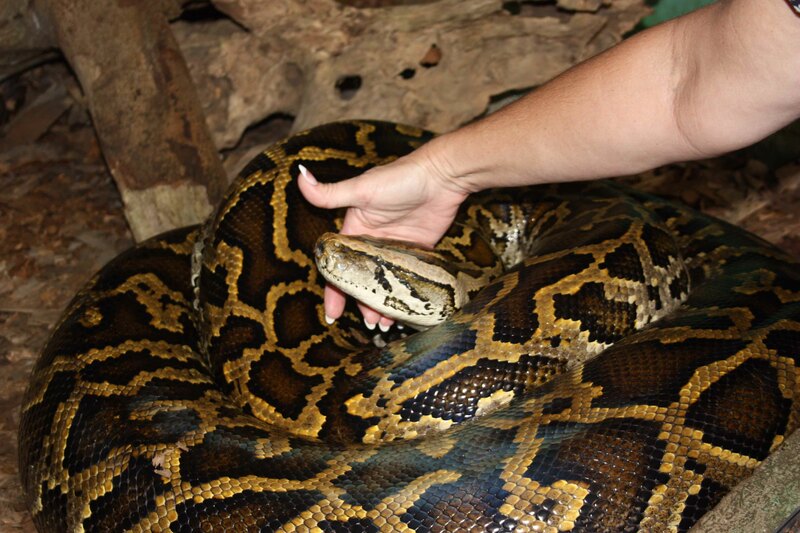 Guided tours available, or guide yourself but you’ll miss out on handling the snakes and gaining interesting facts. -Directions: From La Fortuna – heading out of La Fortuna, go west on route 142, driving in the direction of the Tabacon Springs Resort, continue about 1 mile (1.5 km) to the small police station (total distance to this point is about 9 miles [4.5 km]). Turn left onto the gravel road. Pass the Arenal Park entrance, cross a small bridge and you will immediately see their sign on the right . Turn right and continue 5 miles [8 km]. After crossing a one-lane wooden bridge you come to El Castillo at the dead end; turn left and continue up the hill about 500 yards [½ km]. The serpentarium is on the right. The butterfly conservatory is up the road a little further on the right. Frog Gardens. This is the largest frog gardens in Central America housing 30 species of frogs including the rare Glass Frog, Red-eyed Tree Frog, Poison Dart Frogs, Poison Frog and the Thin-toed Frog. Snake Gardens featuring 15 species of snakes including the Fur de Lance, Boa Constrictors, Hog-nosed Pit Viper and the Central America Bushmaster. Night Walk starts at 5:30 p.m. and lasts for two hours. Guided tour by reservation only. 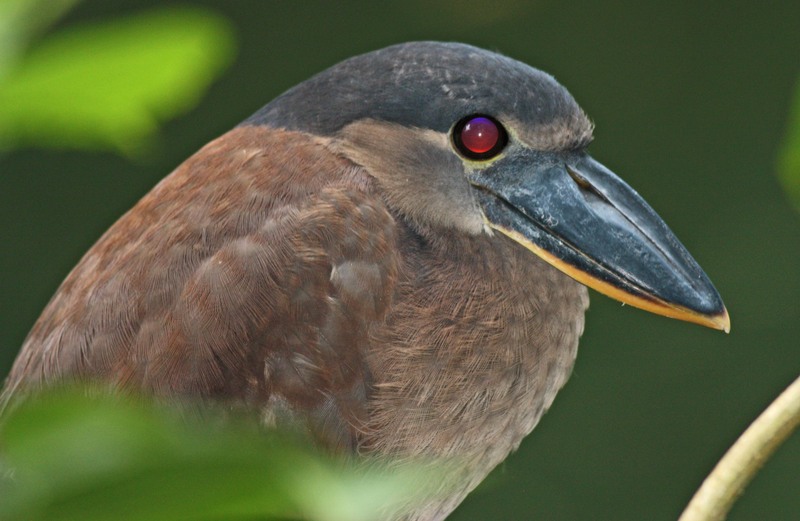 Bird Watching Walk starts at 5:30 a.m. and lasts for three hours. Guided tour by reservation. Plan to spend about 1-1/2 hours on the guided tour. 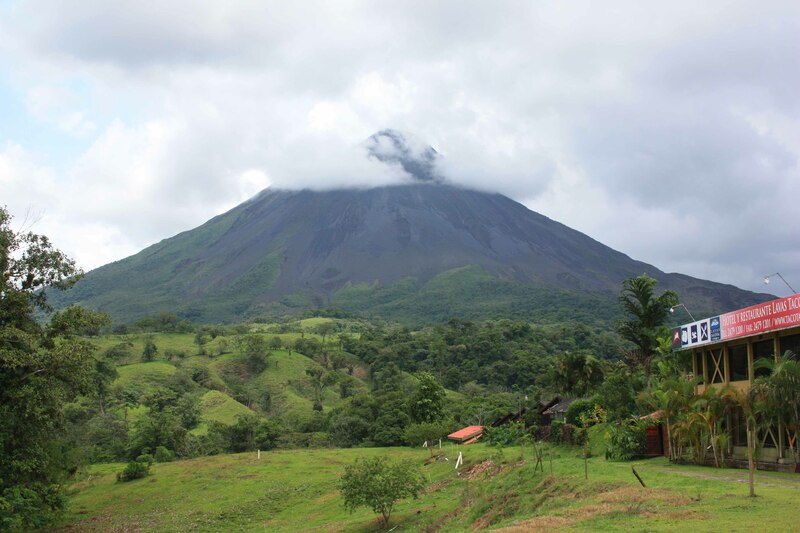 -Directions: Located 6 km west of La Fortuna towards the Arenal Volcano, 300 meters northwest of the entrance to the Hotel Volcano Lodge. -Hours: Open daily from 8:00 a.m. to 5:30 p.m.
46 square miles (29+ acres) of park to roam at your leisure. Key feature is the Arenal Volcano. To hike the entire park takes about four hours. The biggest excitement is to stand on a small hill and take your photo of the volcano in the near distance. There are numerous signs warning of the danger of getting too close to the volcano. A few years ago a guide and tourist violated the “safe distance” rule and were found dead due to the noxious fumes. So don’t be stupid. There are several trails to hike in this park. If you take the trail in front of the restrooms, it will circle around the backside of the restrooms. There wasn’t much to see here. It hits the main road in the park, and you can turn left to go to the observation point where you can sit and relax. If you cross the road, you continue on to the volcano, passing a small lake that is home to ducks. On the trail to the volcano, you can turn off onto another trail on the right that circles around for about a 45-minute walk. Here you will come across this super huge tree PHOTO that they tout as being the largest in the country. Again, we did not find any wildlife on this hike. The most wildlife we found were a couple Magpie Jays at the restroom. They are really beautiful, and made the long hike worth it. PHOTO. When you’re done with this hike, head on back into town and have a brewski at the Lava Lounge. They have some very good ceviche. -Directions: Take the road from La Fortuna. Continue past the Tabacon Resort (total distance at this point is about 9 miles [4.5 km]); continue for about 1 mile (1.5 km) until you reach the police station; turn left; follow the road for about 1¾ miles (2.7 km) to the park entrance on the left. For an all-day event, float down the river that separates Nicaragua from Costa Rica. 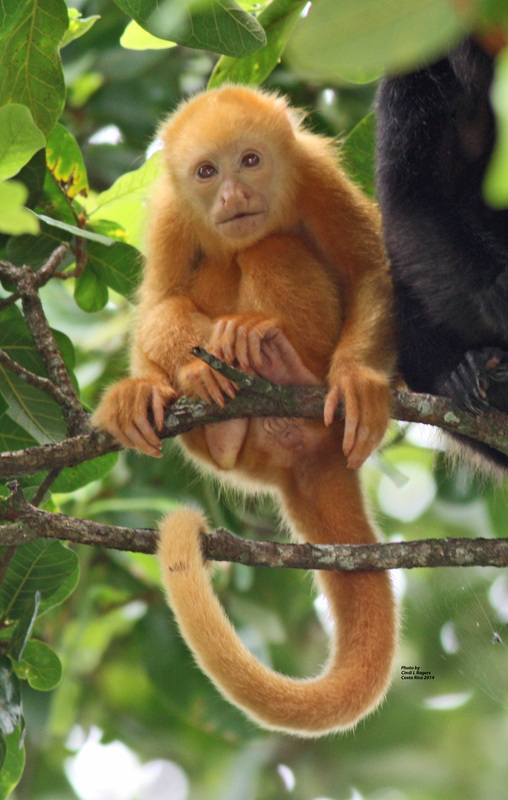 Tour guides point out three species of monkeys, sloths, birds and a multitude of other wildlife. For sure it’s a relaxing ride and you will be sure to visit it time-after-time. You must book a tour to enjoy this all-day adventure. The boat at the river only runs when reservations are made through a tour group. Check with your hotel or visit one of the tour agencies in town. Canoa Aventura is the one I have always used. Their guides are wonderful—very personable and knowledgeable. The tour group will pick you up at 7:30, and there will probably be 6-8 people in the entire group. The drive to the river is about two hours with the final half of the drive on one of the famous bumpy Costa Rica roads. During the ride, the tour guide talks the entire time about the wildlife, culture, Costa Rican rum and the cost of fruits in the store. It’s really educational and will make the time go by quickly. During the ride, the driver and guides are constantly watching for animal sightings. 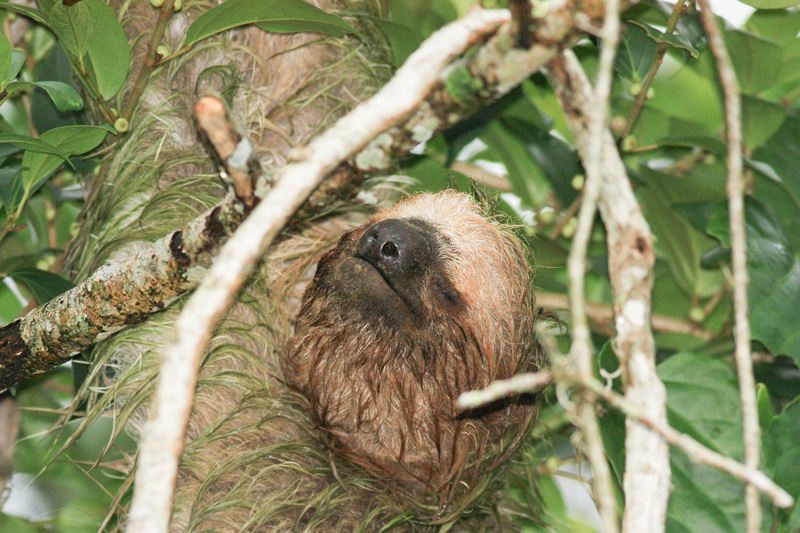 On the first trip I took the driver spotted a sloth way-y-y up in a tree in the pasture, and on the second trip he sighted a sloth in a tree at the road’s edge. The driver stops so you can “Ohhhh and ahhh.” More than likely you’ll see various marsh birds like the Tiger-striped Herons. The group makes a stop in a little town so you can potty & stretch. The store/restaurant is situated on the edge of a little river at the bridge. Growing up from the base of the river is a super tall tree that overhangs the area. At the top of that tree look very closely because there are dozens of Iguanas perched in the tree top. 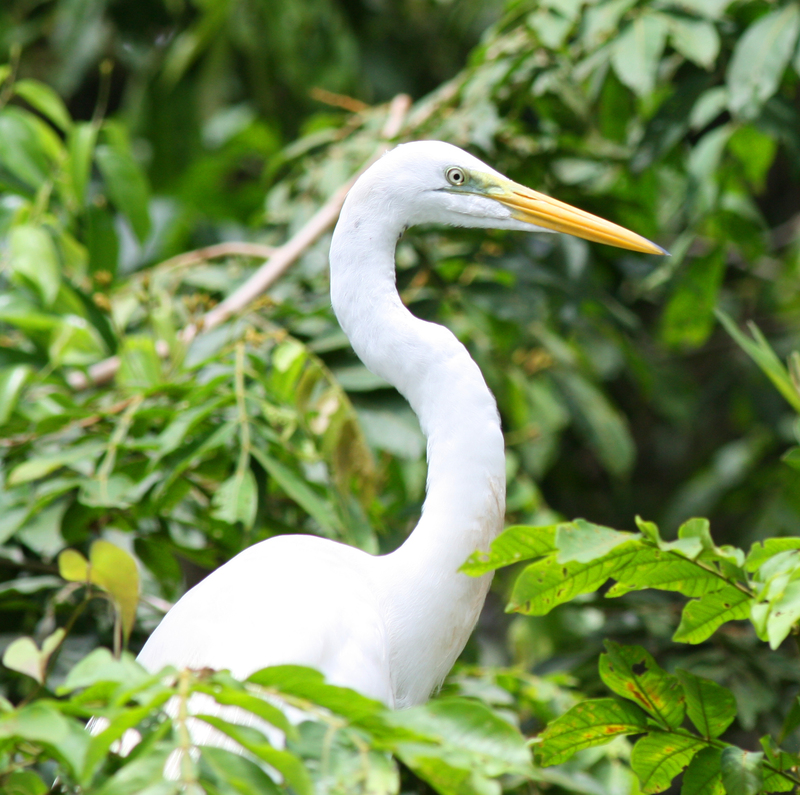 The females perch in the trees to bask in the sun while the males stay on the ground to protect the eggs from poachers. 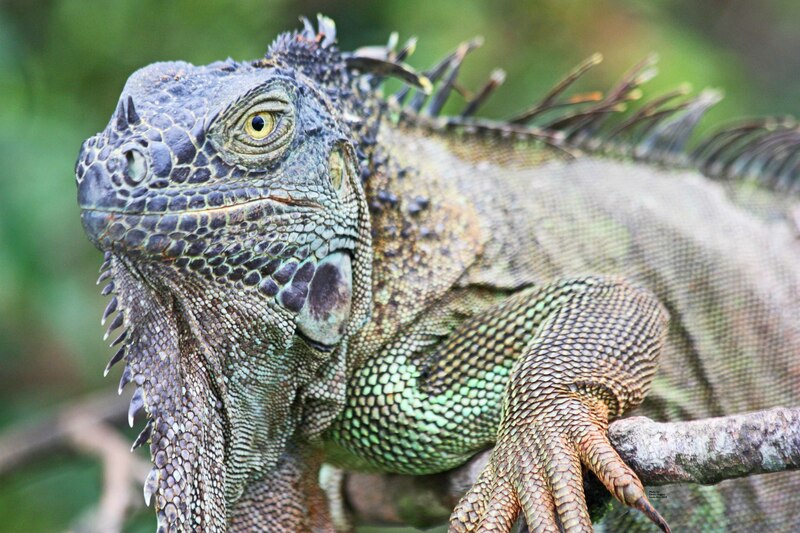 The story is that the Iguana became known as “Chicken of the Trees” because they taste like… you guessed it….. chicken. (Why is it that frogs taste like chicken, Iguanas taste like chicken, alligator taste like chicken?) Get plenty of photos as people back home won’t believe your story. At the river, you are served a light brunch. You’ll board the boat and start searching for wildlife. 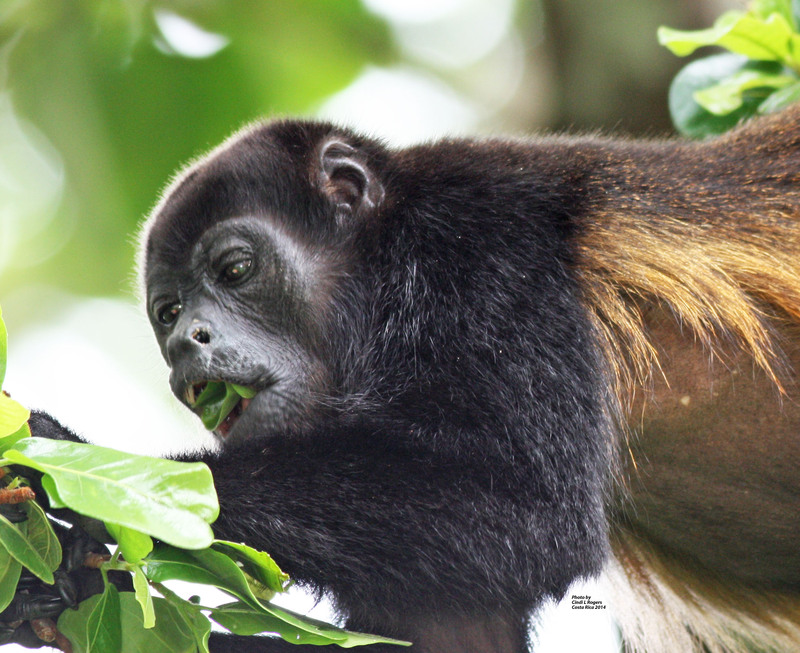 Within five minutes you will have your first view of Howler monkeys. In this family is a female youngster that is an orange color. Floating you will pass a large stump protruding from the river. This is where many pointy-nosed bats roost. When I researched pointy-nosed bat, I could only find information on the Long-nosed Bat that looks to be the same thing. I would assume they are one-in-the-same. 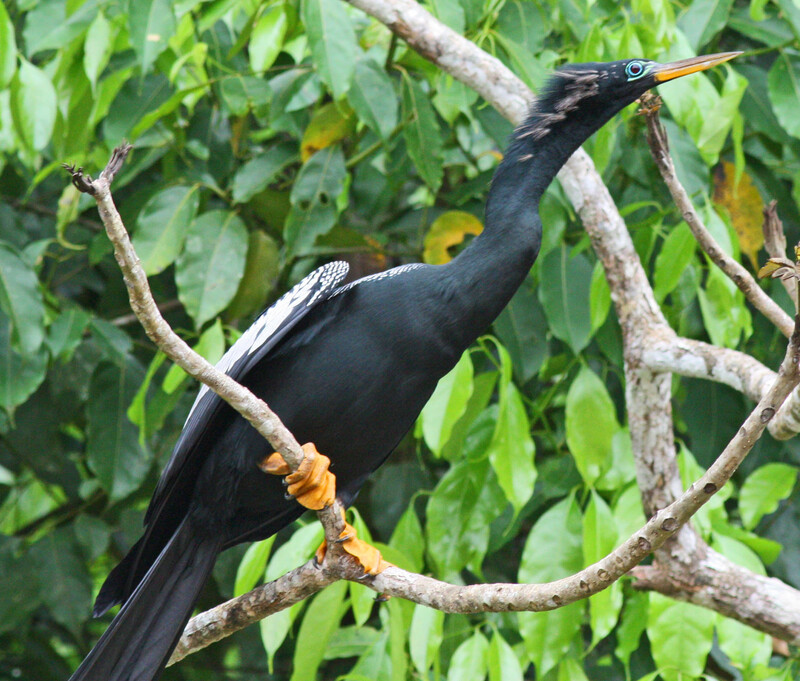 You will see the “Snake” bird, aka, Ahingua-Ahingua. They swim with their bodies completely immersed but neck and head visible. 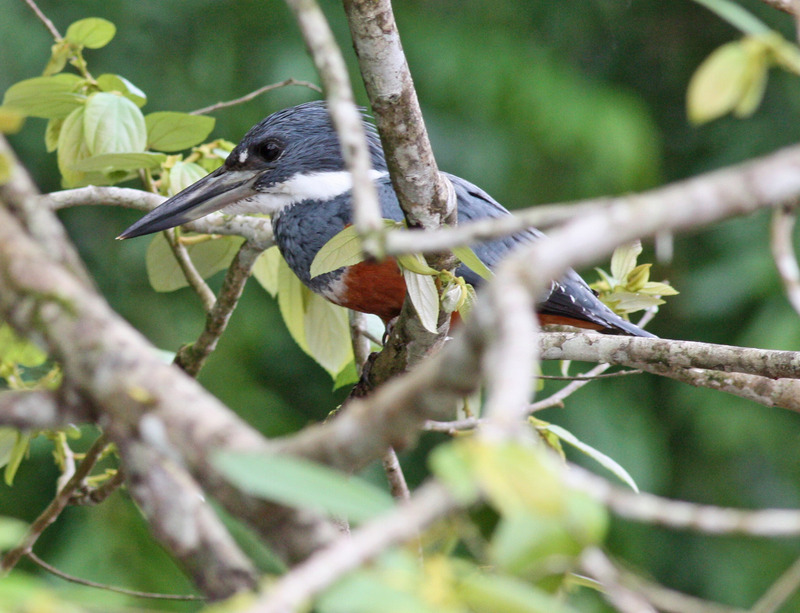 I have seen the Amazon and Ringed Kingfishers. Swallows and various other birds including the Great White Egret. Of course, there are plenty of Caiman and turtles. 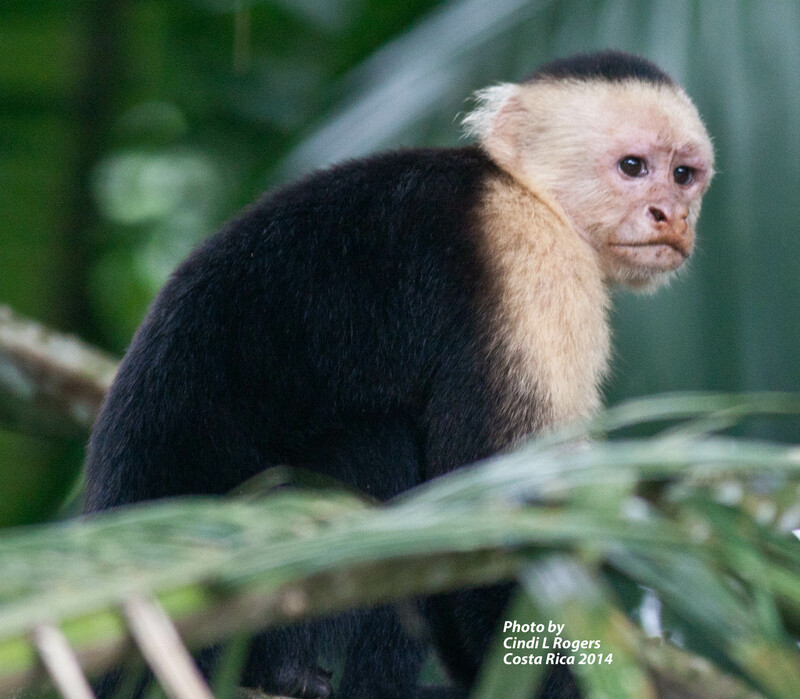 As you round the bend in the river, be on the lookout for the Black-handed Spider Monkey high up in the palm trees along with the Capuchin. There is nothing better than to observe these creatures out in the wild instead of always captive in a zoo. After two hours on the river (and undoudtly enduring a rain shower), you return to the landing where they serve a delicious lunch. Day is done about 2:00 and you will head back to La Fortuna. This is an absolute MUST SEE AND DO activity for kids and seniors. It’s one activity you can do that is quiet and doesn’t entail a lot of walking. NOTE: For quality photos, you really need at least a 300mm lens, preferably 400mm to get quality photos. You also need to be sure you take along a “COPY” of your passport since you are on the Costa Rica/Nicaragua border. Please leave your original passport back at the hotel in the safe. -Cost is about $65 and includes transportation, lunch, boat ride and tour guides. 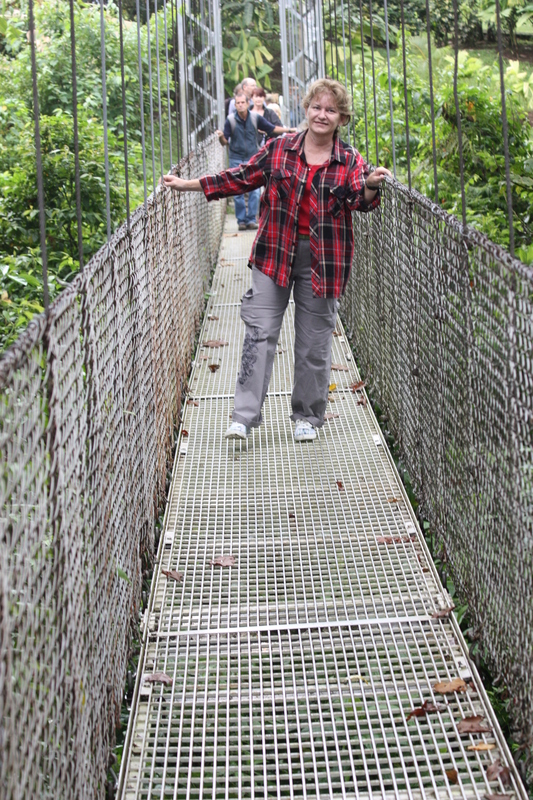 This is something I do with each visit to La Fortuna. You can take a self-guided tour or they offer guided tours plus night walks. It takes about an 1½ hours to walk the park. 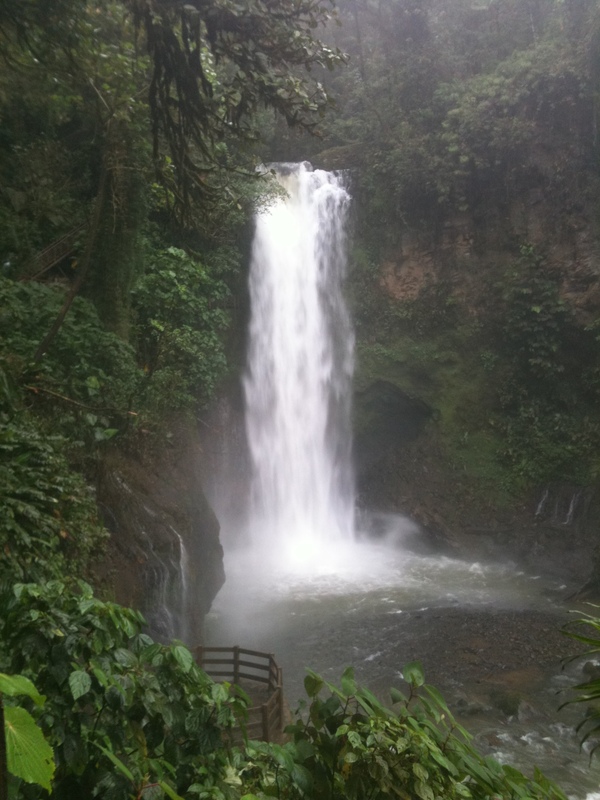 -Directions: They are located about 1 mile (1.5 km) outside of La Fortuna. Head out of town on route 702; about ½ mile (.8 km) look closely for the sign on the left or you will miss it (this is Diagonal 301 road – a rock road – drive slowly!) Park is on the right about 1 mile (1.5 km) from the route 702. Located on the west side of Lake Arenal, there are 16 bridges to cross while enjoying a 2-hour hike covering almost 2 miles (617 acres). 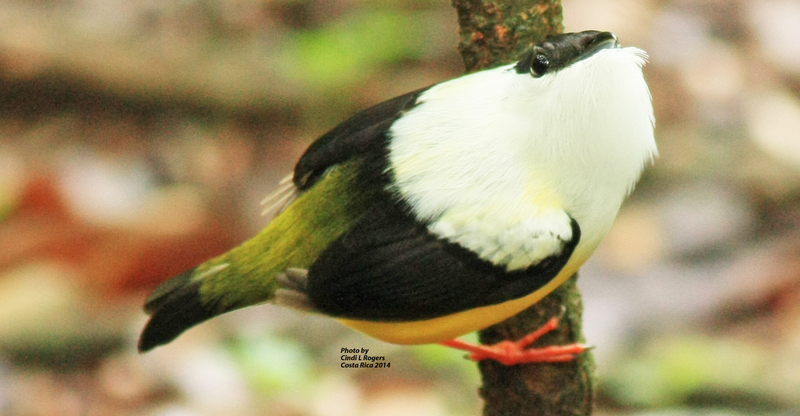 Be on the lookout for birds, tarantulas, Leaf-cutter ants, butterflies and wildlife. A small waterfall is included so don’t miss the path! No need to make pre-reservations. Only if they have a tour bus arrive would you be inconvenienced. Tours are self-guided unless you want to pay extra for a guide. Exquisite waterfall; animal park; hummingbird garden; serpentarium; restaurant. I felt the entrance fee is well over-priced. However, the buffet was in-line with a customary buffet with all you can eat. But you need to be there at lunch time—not at 2:00—as they don’t seem to replenish the quantity of food. They have lovely gardens and paths that lead you to each area of specialty. Disappointedly, it was rather difficult to see the carnivores as the glass windows were clouded with moisture. The serpentarium housed many snakes in rather small displays, but you get a great over-view of the snakes within Central America. 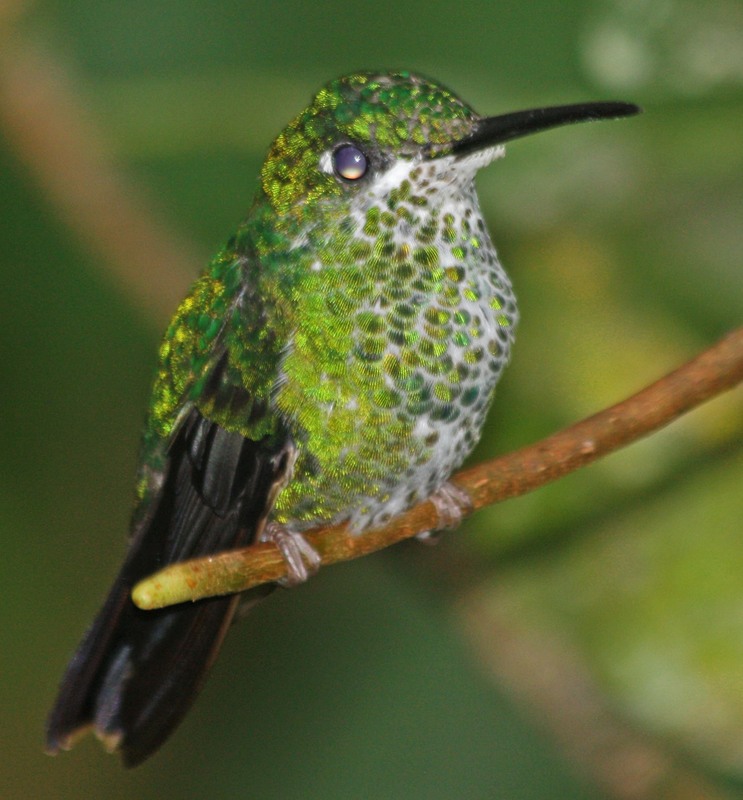 In the open-air center, before entering the restaurant, is an area full of more hummingbirds than you could ever imagine seeing in one place. They flew in, buzzed around the multitude of feeders, and out again. It was truly a magnificent sight to see. 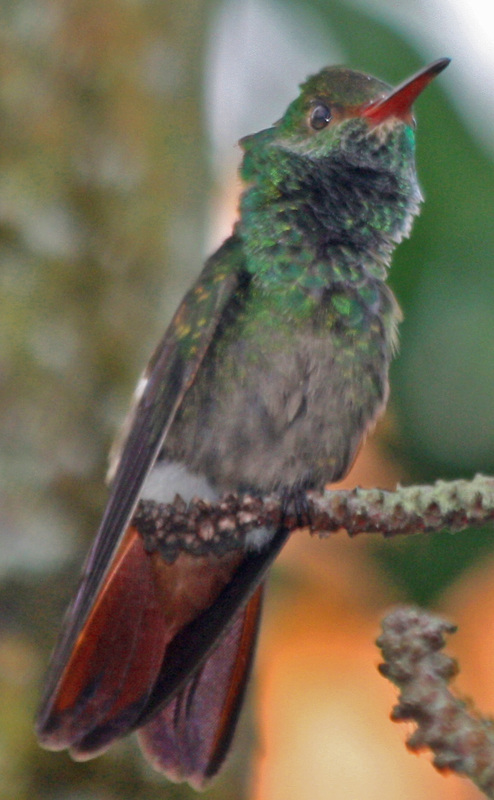 So DON’T miss the Hummingbird area. From there, you descend the many, many steps to the totally amazing waterfall of all times. I have to tell you, this is the only waterfall I’ve been to so far that had actual “steps” made-man from steel. (The steps to the other waterfalls are hewn in the ground and can be rather treacherous.) One of the best things about La Paz is that there is bus service from near the bottom of the waterfall back up to the lodge if you cannot manage taking the stairs back to the top. You’ll laugh when you board this old school bus that must be from my high school days back in the 70s. It must have gotten up to a speed not more than 1 kmh. The driver just sat there with his foot through the footboard and I am sure he was praying the entire way. 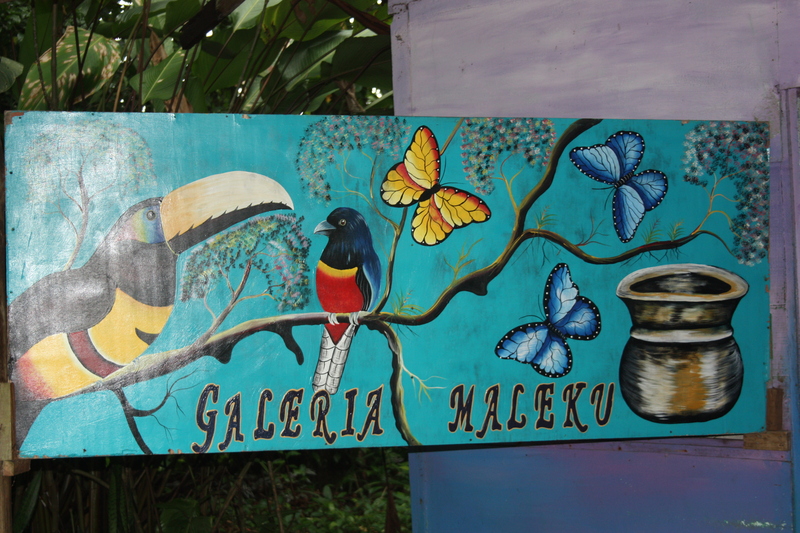 It was well worth the visit for the hummingbirds and waterfall, but again, I felt it was over-priced. -Entrance fee: $38 (adults); $22 (kids 3-12 years). Buffet lunch: $13 (adults); $7 (kids 3-12 years. 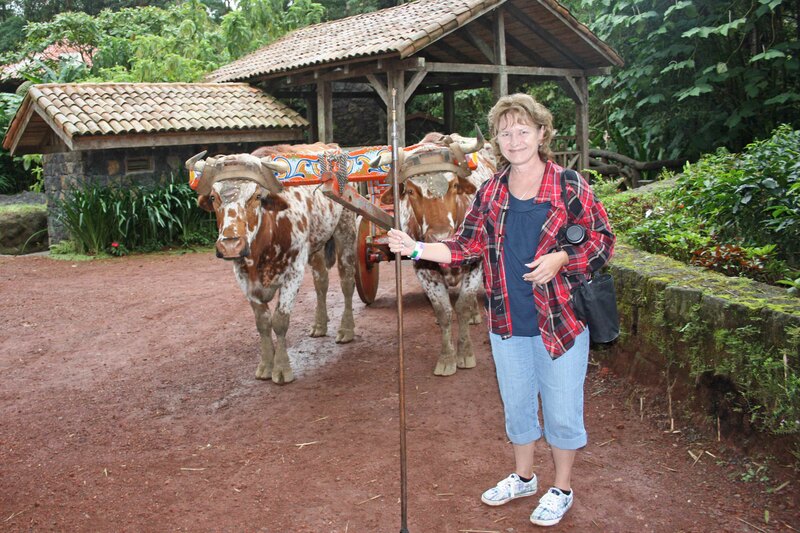 Self-guided tours and guided tours ($45/hour). Directions: Leaving La Fortuna on route 142 / 141, drive 5 miles (8 km) towards El Tanque; turn left at the first intersection across from the hardware store. Drive about 1.8 miles (3 km) and after passing a little bridge make a right turn at the first intersection going towards Muelle. Continue for about 12½ miles (20 km) to the intersection with a gas station on the left. Go straight on this road for about 8 miles (13 km) to an intersection with a field of palm trees on the left; turn right and drive about 3¾ miles (6 km) to a dead end intersection; turn right and drive about 3¾ miles (6 km) to the town of Aguas Zarcas. At the stop sign you will see a church across the street; turn left towards Venecia. Before entering Venecia (at the blinking light), bear left and go through the town of Rio Cuarto towards San Miguel. At San Miguel, take the first right at the police station. Continue up the mountain for about 20 minutes and the road will turn into a gravel road that is being repaired from the 2009 earthquake. The last 2½ miles (4 km) of the road will be rough gravel but passable. La Paz Waterfall will be on your right as you go over the bridge on your way up the hill. From La Fortuna it takes about 3 hours to drive. This 197-foot cascading Las Musas waterfall that flows into the Barranca River is just outside of San Ramon (40 miles west of San Jose). There are no steps involved to reach the waterfall except for a few 4″ steps down as you walk the path. It’s easy-going for anyone. They have a restaurant, large pool with waterslide and hiking trails. This is a 5-minute taxi ride – 3-mile walk from center of town. Take the street on the south side of the cathedral to Piedadas Sur, pass the university & follow the signs. This is a rescue center for animals. They also teach Spanish and accept volunteers. Entrance fee: ½ day tour $29 (adults) and $17 (kids 4-9 years) at 8:30 a.m. and 1:00 p.m. 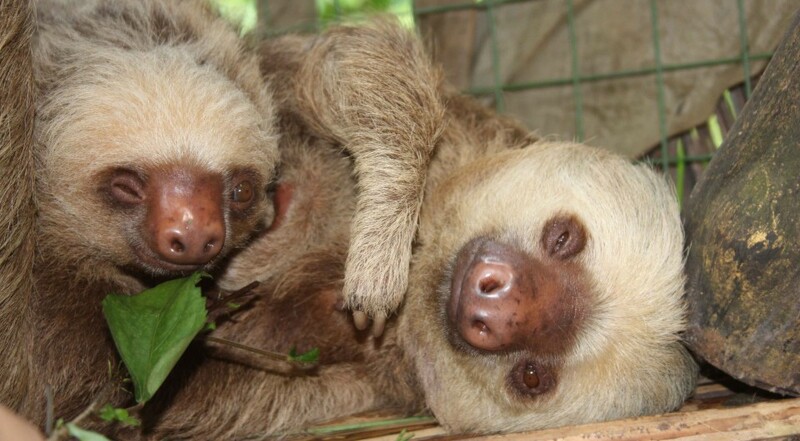 If you would like to volunteer for a day to assist in rehabilitating the animals: 3-½ hours will cost you $51 (adults) and $29 (kids 4-9 years) for 4 hours beginning at either 8:30 a.m. or 1:00 p.m.
-Directions: Heading out of La Fortuna on route 142 / 141 for about 15 miles (24 km); turn right onto route 738 (the Javillos intersection); go west about 1/4 mile (500 meters); after you pass the bridge painted with flowers you will see the center on the right; enter through the green gate. Total distance is about 1 mile (26 km) from La Fortuna on a nice, paved road.